A wide crew neck with a ribbed edge feels great against your neck when you wear this soft, mohair sweater. Long sleeves are loose and warm, finished with a narrow ribbed edge along with the bottom hemline which is tapered for a snug fit. 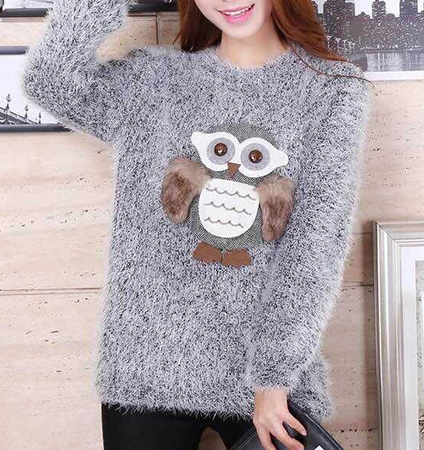 A cute owl applique is stitched to the front of the sweater in the center, which adds graphic interest and texture that you’ll want to touch all the time. Hand washable, this sweater can be dried while lying flat on a towel so it won’t shrink or stretch out of shape. Small size; bust 104 cm, shoulder 46 cm, sleeve length 63 cm, total length 60 cm.